Nov 28, 2016 in "Rivers of Light"
Article updated January 10 2017 to reflect its soft opening status. It has been years in the making and subject to various delays, but Rivers of Light at Disney's Animal Kingdom is now in soft opening. The show official opens on February 17 2017, and soft openings began on February 10. We were part of today's preview, and got to see the show first-hand. This report is largely spoiler free, but if you wish to be completely surprised by the show, stop reading now. First and foremost, Rivers of Light is a technological marvel. There is no question that it is one of the most technological advanced shows that Disney has ever produced. Specifically, the floats that make up the majority of the show are extremely impressive in the way they move. Being driverless, and guided autonomously by computer systems, the floats perform complex choreographed movements, passing within feet of each other. Not only is their motion impressive, so is the show performance capability of the floats. The 5 Lotus floats are equipped with highly articulated fountains, lighting, and projection effects, including rear projection mist screens. During the development of the show, many of the delays have been reportedly due to issues with the guidance system that controls the position of the floats. Many have questioned the need for such a complex system, and why not simply replace the guidance system with drivers. Seeing the show, it is clear why the team has stayed with the driverless approach. Besides the handful of actors that are part of the show, there are no techs, drivers, or signs of any human involvement with performing the show. This is rare for such a show, but is of great importance for the execution of Rivers of Light. Additionally, the sheer complexity of the float choreography would also seem to be beyond the capability of driver-based floats. Remarkable, the floats are in near constant motion, even when performing fountain and projection effects. They move extremely smoothly, and are also capable of appearing to remain in a perfectly fixed position. The propulsion system has multiple jets around each float that work in tandem with the guidance system to fix a position, and it is extremely effective. Unlike other shows that use tracks (Fantasmic!) 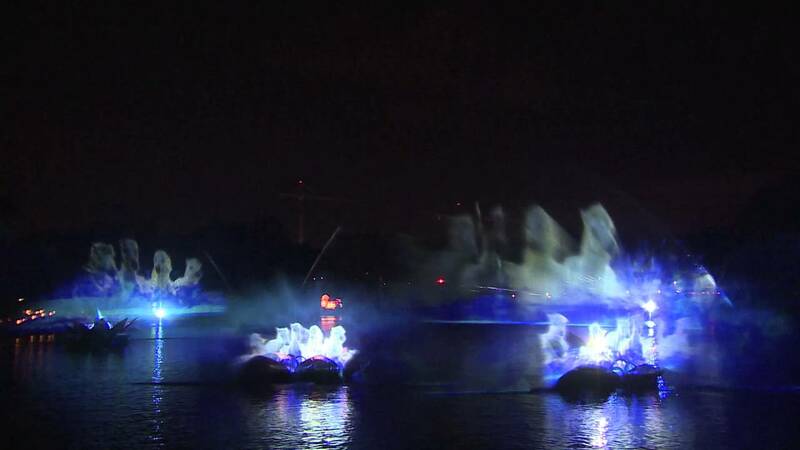 or fixed anchor points (Reflections of Earth), the floats in Rivers of Light are able to travel anywhere in the waters and this capability is used extensively. The Lotus and animal floats travel throughout the river, giving every seat a great view, and adding a great sense of motion and energy. The difference between the fluid Rivers of Light and very static Jungle Book show is stark. The lighting system used around the theater is also noteworthy. The trees that form the background to the show are constantly alive with special effects. Shadows of animals moving alongside the water are particularly effective. Show audio is very well executed, with highly localized sound matching on-stage effects, along with crystal clear playback of the stirring soundtrack. Surround sound is difficult to achieve in a wide open space, but is done very well at Rivers of Light. Rivers of Light promotional image. Copyright Walt Disney Co.
Thankfully the show has stayed true to the unique nature of the park, and does not incorporate any movies or existing stories. Having said that, many guests will probably not really see much of a story, but more a collection of imagery unfolding before them. Rivers of Light fits into Disney’s Animal Kingdom in the way that Reflections of Earth fits Epcot. It is subtle, beautiful and impressive. Quite the opposite to the summer’s temporary show, Jungle Book Alive with Magic. 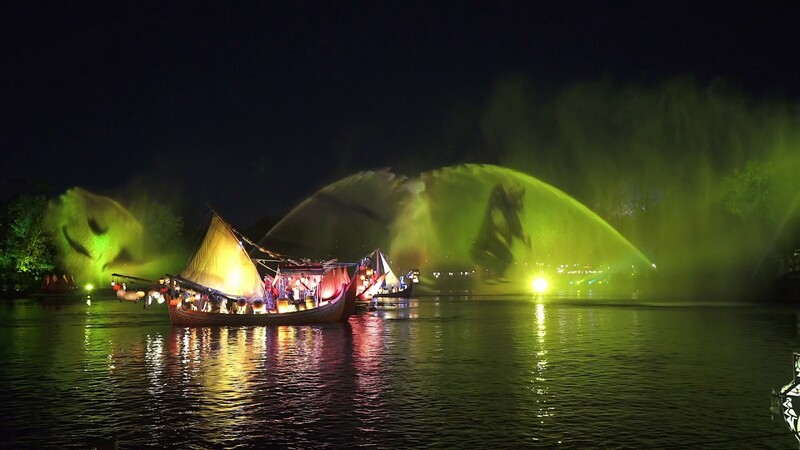 A show length of 16 minutes puts Rivers of Light at one of the longer nighttime shows, and breaks the recent trend of a 12 minute nighttime show. Based on tonight’s preview, it is clear that Rivers of Light is something special, and very different from the other Walt Disney World nighttime shows. It’s closest relative would be Reflections of Earth, but it is of course not a firework show. The show will appeal to guests in different ways. There will be those who marvel at the technology, those that see beautiful imagery, those that will enjoy the intimate and enveloping staging, and perhaps those that just see the show as floats moving around with fountains. Perhaps the biggest criticism we have, is that there isn't a real sense of finale or conclusion. Somewhat like a song that fades out, the show concludes in a way that might leave some wanting more. Rivers of Light is without doubt an impressive production, and something that will restore many people’s belief that Disney rules the world of nighttime spectaculars.